Community resilience: An urban eco-village? Most of us are deeply embedded and enmeshed in the status-quo economic systems that have led to our current socio-ecological predicament. Our dependence on fossil fuels and resulting climate change is just one aspect of how we live as a society and how we undermine our deeper happiness. While collectively training ourselves to say NO to powerful institutionalized forces that are destructive is crucial, we also need to say YES to building cultures, economies & lifestyles that will regenerate our ecosystems and heal our relationships with ourselves, our neighbors and all species on the planet. How do we collectively go beyond hyper-individualism and the spell of materialism/convenience/speed and “relocalize” at the scale of local landscapes? 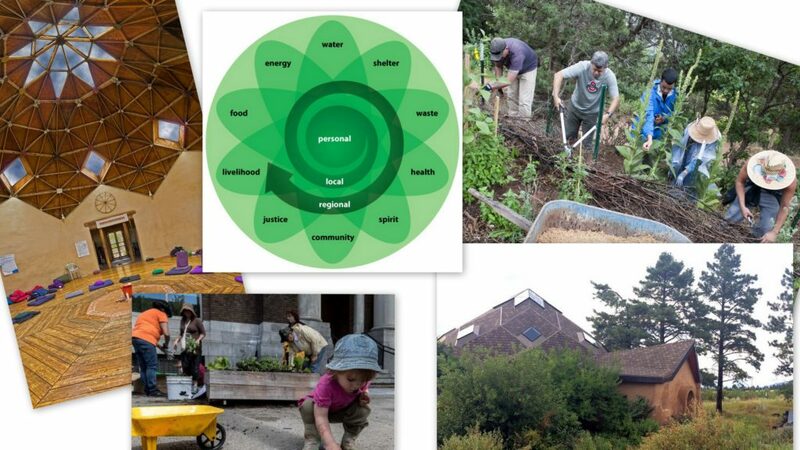 How can we build an “Eco-village” in the Front Range (or retro-fit existing infrastructure) to provide for the inner (psycho-spiritual) and the outer (institutional) healing, empowerment and resilience, especially for those of us on the frontlines of activism? What is already being done and how can we go beyond what is already being done? We formally started this exploration with Ann Morrow and Kritee (Kanko) on Nov 4, 2017 (see event details and resources here)! Please check back for updates as we further root our vision in the Boulder-Denver community! If you would like to join our practice group that discusses these issues routinely, please contact us. — What is already being done in Boulder for community resilience? — What does an Ecodharma community look like? © Boundless in Motion 2019. Windflaw designed by Loft.Ocean.